On 2 December 2016, the progressive family in Europe will be in Prague to talk to citizens and civil society about shaping Europe’s digital future. The event will focus on how these changes are affecting young people, our social models and the role technology can play in promoting equality. It takes place alongside the Party of European Socialists (PES) Council, which is happening from 1-3 December in Prague. The event features prominent speakers from digital industries, academia and politics, including Myriam El Khomri, French minister of employment, Nicolas Schmit, Luxembourg's minister of social affairs and digital, Tomas Prouza, Czech state secretary on the digital agenda, Pille Pruulmann-Vengerfeldt, Malmö University, Christof Degryse, ETUI, Mark Walker, Abilitynet and S&D Group vice-presidents Josef Weidenholzer and Marju Lauristin. 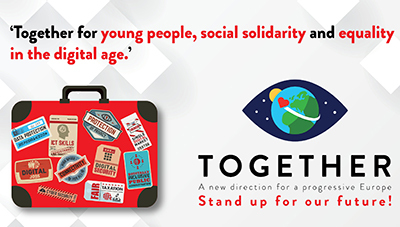 The event is part of the Together initiative that launched in October this year, which involves working with citizens across Europe to find new progressive solutions to the major issues facing our continent. The event will culminate in the adoption of a Digital Declaration outlining the priorities for the progressive family on the Digital Union.